Karel Kryl (April 12, 1944 ? 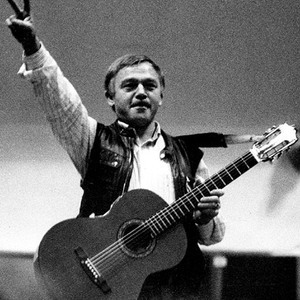 March 3, 1994) was a Czechoslovak popular author and interpret of many "protest songs" in which he strongly criticized and identified shortcomings and inhumanity of the communist regime. Born on April 12, 1944 in Krom??? ?, today Czech Republic, son of Karel Kryl and Marie Krylov?. His father owned printing business, which was confiscated from the family in 1948 upon communist takeover. Born on April 12, 1944 in Krom??? ?, today Czech Republic, son of Karel Kryl and Marie Krylov?. His father owned printing business, which was confiscated from the family in 1948 upon communist takeover. Karel Kryl moved to Prague in 1968, as an assistant in Czechoslovak TV. In his spare time he played his songs in numerous small clubs. When armies of Warsaw Pact occupied Czechoslovakia on August 21, 1968 to suppress the democratization movement of Prague Spring, Karel Kryl released album Brat?? ?ku zav?rej vr?tka (English: Close the Gate, Little Brother), full of songs describing his disgust over the occupation, life under the communist rule, and rude inhumanity and stupidity of the regime. The album was released in early 1969 and was banned and removed from shelves shortly after. This work became icon of anti-communist movement for years to come ? when he returned from exile in 1989 during the Velvet Revolution, almost every little child in Czechoslovakia knew the lyrics of these songs by heart. Faced with certain imprisonment, Kryl left Czechoslovakia in 1969, and lived in West Germany. Most of the time in exile he worked for Radio Free Europe. In exile, Kryl released a number of albums. Some of his songs almost became traditionals, known by everybody in the Czech Republic, sung by all campfires. During the enthusiastic November days in 1989, Kryl returned to Czechoslovakia only to experience bitter disappointment with the transformation of society. On March 3, 1994, just a month before his fiftieth birthday, Karel Kryl died of a heart attack in Munich hospital. He recieved posthumously the Order of the White Lion - the highest czech decoration.